A beautiful take on a pea and ham soup it is a typically classic dish with a twist. 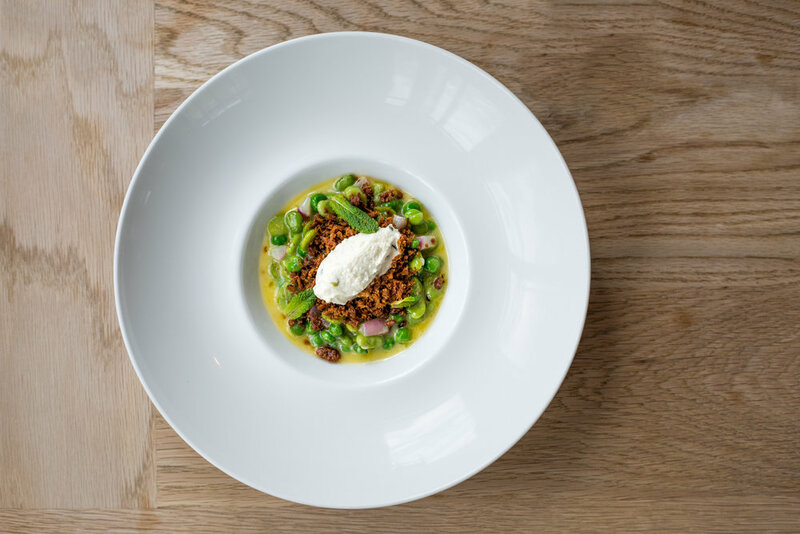 The pancetta is freshly homemade by our chefs who make it themselves, it is delightfully creamy and salty and the pairing of this flavour with the peas creates a smoky, warming effect. The gentle crunch of the blah. Garnished with fresh mint to create a certain zestiness, it pairs perfectly with Bourgone-Aligote Wine. Asparagus season has come in May this year and it is a deliciously fresh and juicy addition to the menu. Our chefs use Wye Valley Asparagus which is arguably the best kind and it is steamed in white wine to create a wonderful aromatic and salty feel. The creaminess of the Hollandaise compliments the freshness and gentle crunch of the asparagus and the addition of the fried egg, which has been cooked for 45 minutes bring a wonderfully gelly texture to the dish. Rich, thick and delicious, the smoothness of the risotto is amplified by the exquisitely creamy Truffle Royale. The Kale adds a gentle crunch and the almonds add a nutty texture to the buttery nature of the dish. A real heart-warming and satisfying dish, it pairs perfectly with a glass of white Aroa Laia as it has buttery notes that goes well with the cheesiness of the risotto. This incredibly seasonal dish is a wonderful synthesis of textures. 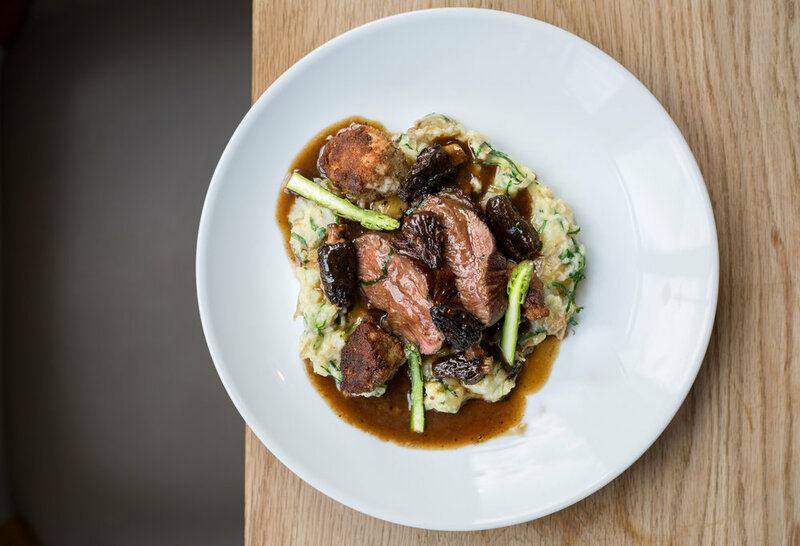 The soft jersey royal potatoes, paired with the crispy sweet breads and the moist, tender, slow cooked lamb rump create a most divine sensation. This is our Head Chef’s favourite dish as it epitomises our entrée into the spring season.